The picture above is from the Ganashakti – the official organ of the Communist Party of India (Marxist)[CPI(M)]. 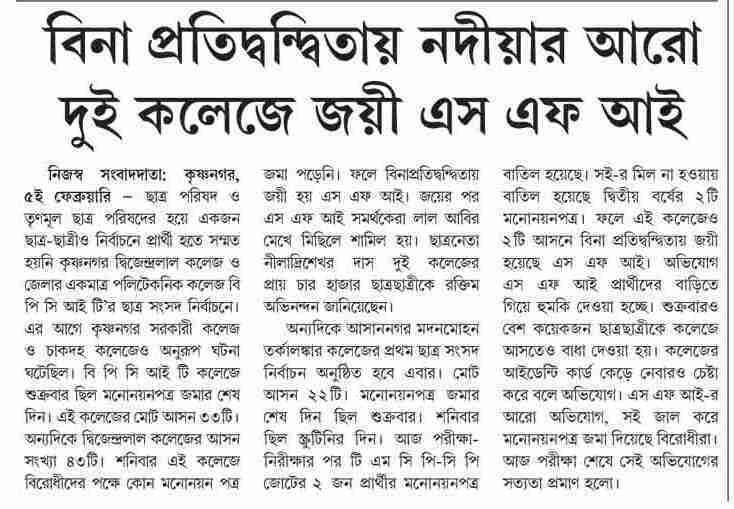 Before losing power, such news items presented the face of ‘democratic student movement’ in West Bengal. Being in Bengal, one knew what these ‘uncontested wins’ meant and the the sheer violence that was often behind these lack of contestations. There is a certain way in which certain spokespersons of darker people sell ‘movements’ happening in the third world to primarily white audiences in the first world. They act as non-partisan but ideological warriors. Curiously those representing this strand from India include many from the CPI(M), the foremost among them being Vijay Prashad. A recent article by Vijay Prashad in the widely read Counterpunch is a case in point where he paints an alarming scenario about the recent happenings in West Bengal – especially with reference to the death in police custody of Sudipto Gupta, a student activist of the SFI. Previous Killing Print Culture: Must FORUM Die? So, the current government did something bad. But the past government also did something bad, so we shouldn’t care. And also, there is something wrong with the person reporting the wrong-doing.